Credit Suisse, one of the world’s leading financial institutions, offers investment products, private banking and advisory services to private and corporate clients. NEO is proud to be a longstanding partner, having created memorable marketing programs for their various businesses over the past decade. From Investment and Private Banking to Technology and Human Resources—we elucidate their messages through various print and interactive media. Although individual projects have specific objectives, the common thread that runs through all endeavors has been the inspirational brand promise of “Helping Clients Thrive.” It is this underlying foundation that drives the objectives and desired results of every project within the bank. NEO was tasked with repositioning the Investment Banking division as global, expert and ready to assist clients on the ground, anywhere in the world. 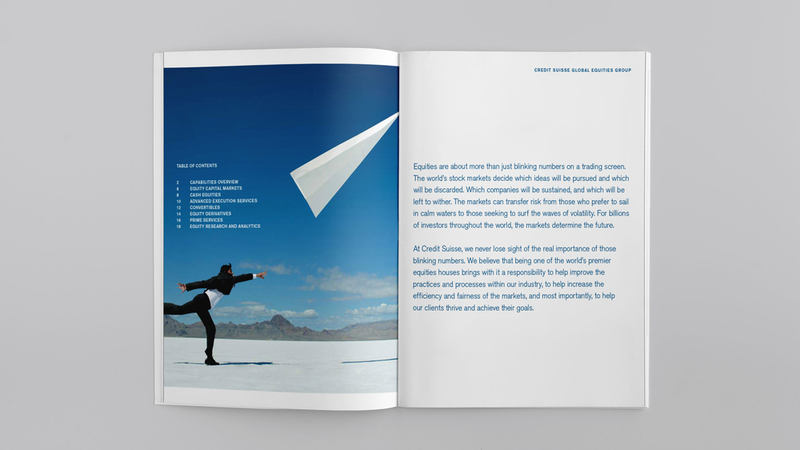 Extensive due diligence, including research and interviews with other Credit Suisse businesses and senior management informed a new nomenclature, clearer organization of their products and services, and a brand architecture that supports the strategic goals of the investment bank. 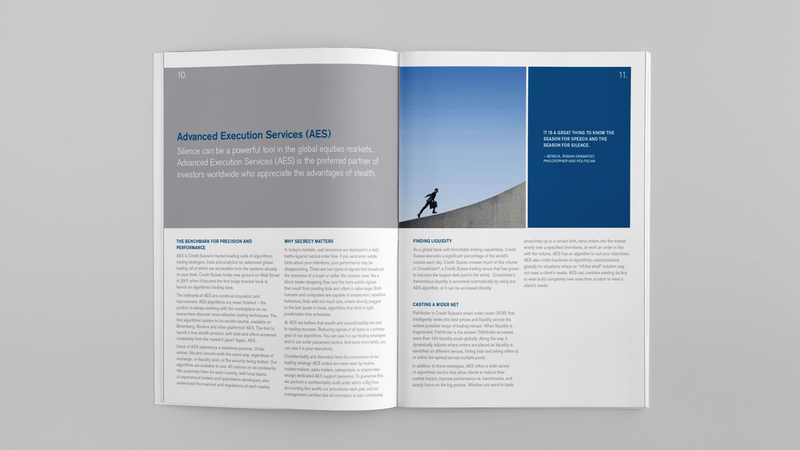 Marketing collateral for one of the world’s premier equities houses highlights their responsibility to improve processes and promote fairness within the markets. A video for the Private Banking group creates an emotional connection with high net worth clients about the strength of their advisory services. Within the Investment Banking business, new websites for Exchange Traded Notes, Credit Suisse Liquid Alternative Beta and Structured Notes conveys the bank’s expertise in delivering alternative investments, indices and time sensitive deal data to various audiences.